When that angry little neighbor dog decides to take a bite out of someone’s child, and you are a medical coder, you will need to be able to assign the correct code. 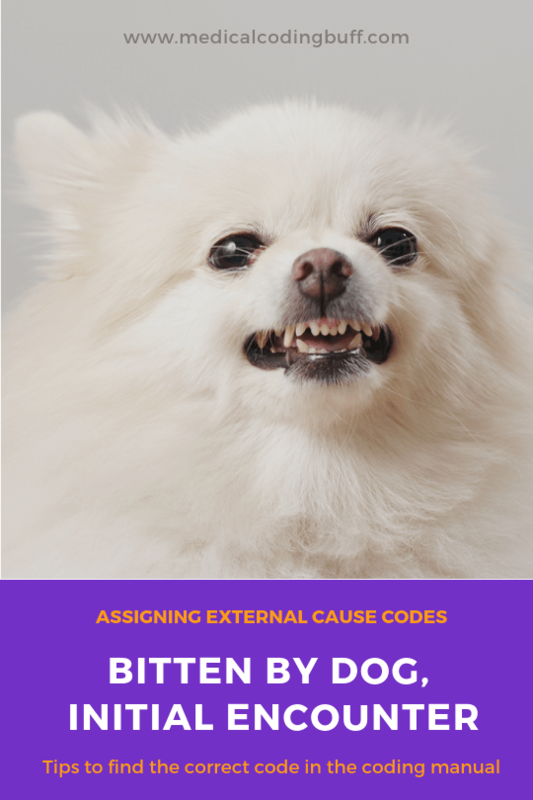 This coding scenario involves external cause codes and the bite from the angry dog. Question: A 7-year-old girl was playing yesterday with her next-door neighbor, and they were running around after each other with squirt guns. The neighbor’s little dog must have felt the 7-year-old was threatening the other girl, and the dog bit her on the leg. On examination, she has multiple jagged bites and a painful open wound in the right lower leg. Assign the external cause code for the dog bite. W54.0XXA, Bitten by dog, initial encounter.We are not being asked to assign for the open bite here. Instead, we need to assign the external cause code, which is a secondary code that can be found in Chapter 20, External causes of morbidity. This code explains the cause of the injury. Looking in the ICD-10-CM External Cause of Injuries Index, see Bite, dog W54.0. Verified in the Tabular, W54.0 refers to Bitten by dog. However, this code is unreportable, because it requires a 7th character. W54.0XXA should be assigned to show it is an initial encounter and patient is receiving active treatment.